This abbey church was founded in 1499 by Oliver King, Bishop of Bath. It was built by Robert and William Vertue, masons to the king. 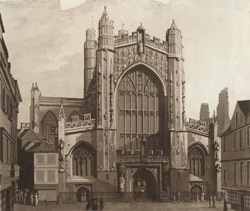 Bath Abbey is one of the few great late Gothic-style medieval churches whose design has remained unchanged to the present day. This is partly a result of the dissolution of the monastery in the 1530s, which halted construction and let to the church being offered for sale to citizens of Bath. Eventually the abbey, stripped of its lead and glass, was given to the city free in 1572.